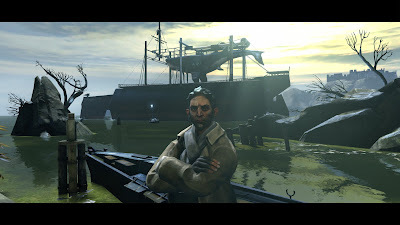 Dishonored is a rare thing: a successful, big league game that is not a sequel. That’s not to say that the game is entirely original, as it remixes a lot of familiar elements. When it comes to gameplay, imagine a more stylized, steampunk version of Deus Ex: Human Revolution with gloomy flavoring reminiscent of Bioshock (though it actually looks more like the upcoming Bioshock Infinite). 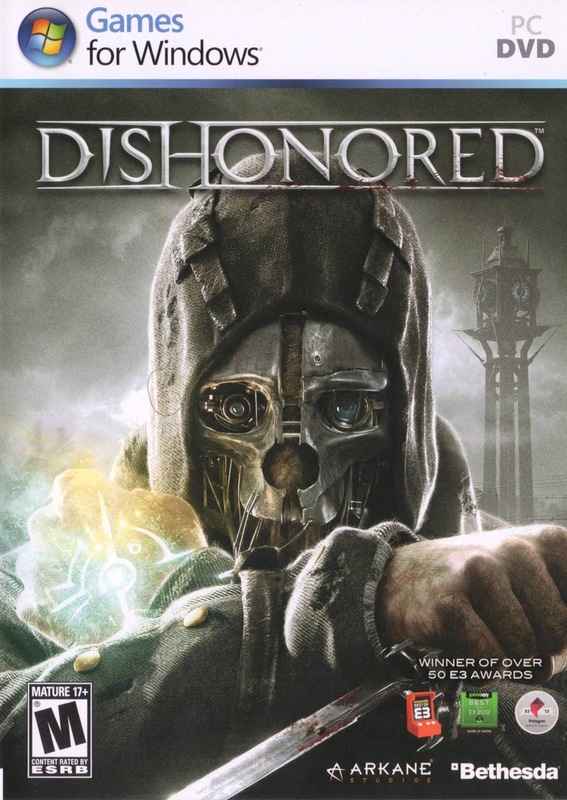 You play the apparently mute bodyguard-turned-assassin Corvo Attano. 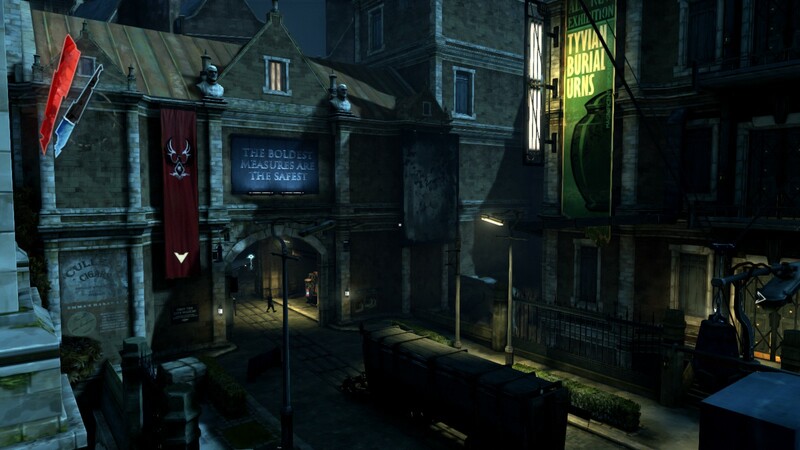 After a trip abroad, you return to the city of Dunwall. This is a seaside place that is preoccupied with whaling, as whale oil is a very important energy source. (And a rather explosive one, as you will discover.) The city is having a hard time, slowly getting overrun by rats that are spreading a deadly plague. You arrive just in time to get framed for the murder of the Empress you were supposed to protect. 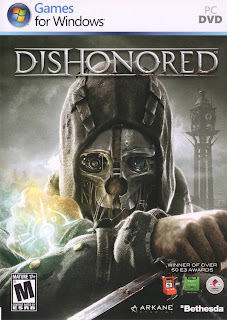 Her young daughter is kidnapped by conspirators who want to take control of Dunwall and it is your mission to rescue the heiress to the throne and either restore order or simply avenge. Your situation seems hopeless at first, but thankfully, there is a shadowy guy from another realm at hand, to creepily watch your progress and gift you awesome powers as a reward for collecting ‘runes’. The most important of these is ‘Blink’ which allows you to zip from one place to another (within a certain range) instantaneously and invisibly. Others allow you to slow or stop time, see enemies and other things of import through walls (‘Dark Vision’), blow enemies away with a gust of wind or to turn them to dust. Dishonored tells its tale as a succession of missions you are sent on. 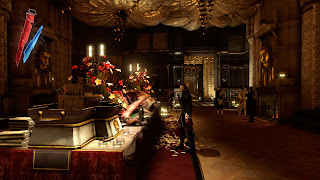 Each gives you a target and drops you in a couple of connected areas, which contain a smattering of guards to avoid/incapacitate and resources to find. So what approach will you choose? You can seek revenge by going on a murderous rampage or take out your opponents by non-lethal means or slip through the entire game as a shadow, undetected. The more people you kill, the more the plague spreads, presumably because of all the dead bodies. It makes the amount of guards you encounter increase as well, and it ups your ‘chaos’ rating. Awkwardly, a happy ending can only be achieved by mostly reining in your killer instincts, maintaining a low chaos rating. It’s odd that the creators are encouraging the stealthy, less bloodthirsty way of playing the game, despite the fact that this gives you less possibilities to get creative. 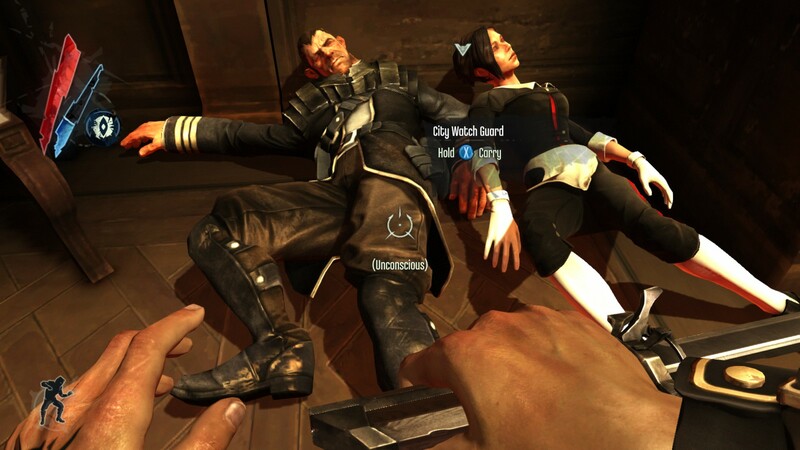 Dishonored hands you a lot of fun, deadly toys and then chides you for using them. The non-violent approach does make more sense for the story, admittedly, as you are most often fighting guards who are not evil so much as misinformed or innocent (albeit aggressive) victims of the plague. And, from what I’ve heard, the game doesn’t fault you for assassinating your main target for each mission. (Even though there is always a non-violent way to get rid of them as well.) But the story could have been tweaked to have a few levels where you would fight some kind of steampunk robots, for instance, enabling you to cut loose without getting punished for it. Discouraging the more creative way of play, seems like a sneaky way of making you spend more time on the game, making you have to play it twice to experience all it has to offer. This is made less enticing, however, by the fact that you will also have to hunt down all the collectibles again to unlock the same powers you acquired in your previous game. Probably the best way to go about it – if you have the time and patience – would be to replay each mission twice right after each other. Once the violent way and once the stealthy way, choosing to activate the appropriate powers for each approach. It doesn’t really benefit the pacing of the story though, and requires managing of game-saves. The guards you encounter as an interesting bunch. For one thing, they seem to share a hive mind. Guards at different parts of the city can be overheard uttering the same weirdly specific phrases, like “Think you will get your own squad after what happened last night?” It’s hard to miss the recurring chatter, so it’s unlikely this slipped by unnoticed during the game’s production. Were they hoping for free publicity? A meme along the lines of Skyrim’s “I used to be an adventurer like you, but then I got an arrow in the knee”? Having a voice actor record a larger amount of more generic lines, would seem like an easy and not all that expensive fix. The guards also suffer from terrible memory, poor peripheral vision and an overall lack of curiosity. If they spot you clearly, but you manage to slip away quickly, they tend to just stand in place for a moment until their suspicion dissipates, rather than go investigate. Anything that happens outside of their official cone of vision (which is visualized in your Dark Vision mode) doesn’t register, even if a door swings open right next to them. Previously closed doors that are suddenly open also go unnoticed by guards doing their rounds, as does the disappearance of colleagues. And the simple act of crouching makes you significantly less visible and audible, even in places where this doesn’t make much sense. I get that these and some other abstractions are necessary to make the stealth approach less frustrating, but it does make the guards look amusingly incompetent. Despite the various behavioral oddities you come across, taking out the opposition or slipping by unnoticed is addictive and fun. Dunwall is an interesting place to roam and the look of it and its inhabitants is distinct and memorable. The story that drives the game is pretty straightforward and it ends with a whimper rather than a bang, especially if you manage to keep your ‘chaos’ rating low. Nevertheless, the resolution is fitting and satisfying, and it seems like there are a lot of interesting places to go with this game world, in the almost inevitable event of a sequel. I’d be very happy to see one, maybe in a different city from the same world and featuring more options for non-lethal playthroughs or no penalty for being lethal. Some sites have called it their ‘Game of The Year’ for 2012 and while I wouldn’t quite go that far, it is a very satisfying way to blow through some free time.